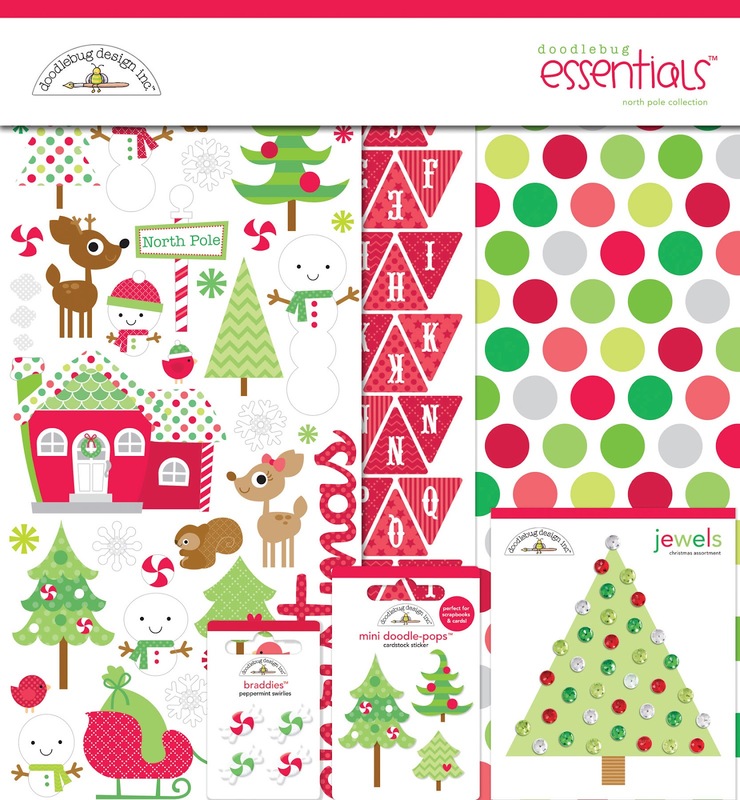 Fun frosted trees and cheerful critters are just the start to our festive new collection, North Pole! A holiday destination that is just the ticket to a Christmas filled with glee & delight. 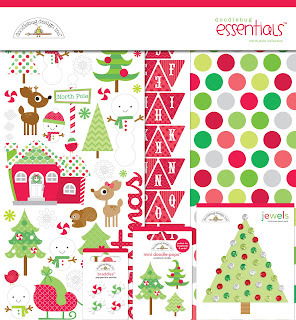 With whimsical pine trees & playful reindeers, this assortment of holiday papers and accents is filled with more jolly spirit than you can imagine. In nostalgic shades of red, green and silver, this winter wonderland is sure to put some flurry into your holiday crafts and keepsakes. 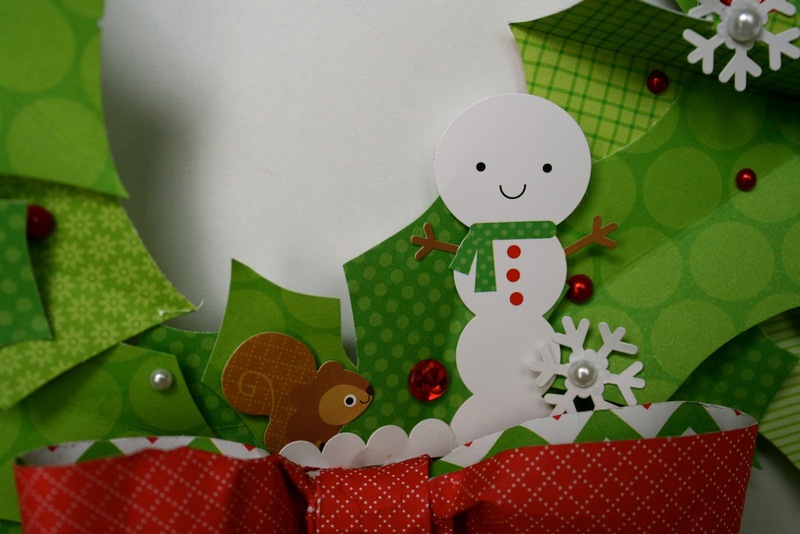 This holiday, take your scrapbooking and papercrafting supplies off the page! Use them for crafts, cards, gifts and home decor. I used Doodlebug's awesomely cute North Pole collection to create this wreath, adding to it some staples ---- pearls, jewels and buttons. I traced a dinner plate, and a dessert plate inside of that circle, onto cardstock to make the base. Cut it out. Then it was ready decorate with handcut holly leaves of various sizes and using a variety of green papers, all folded in the center with the ScorPal. I was sure to leave some still folded and gluing only the ends so that there was some dimension. Then, decorate with all those cute doo-dads in your scrappy space. I created a very small snow scene by the bow, then added two mini doodlepops to pull it altogether. I'm ready to make another in a non-traditional color scheme. Falallalalalaallalalaaaaaaaa! Would you like to win this fun Essentials kit?? Share the link to this fun post from today on your Facebook, or Twitter or Pin the projects and leave a comment for each thing you did. We'll pick a lucky winner on Sunday, September 24th at 11:59pm. Winner will be announced on Monday. Sharing!!! Such an adorable collection! Love it! Shared on Facebook. I shared on my Creative Endeavors FB page! I just pinned the wreath! I love the new collection! Cute projects! I shared on facebook. Love todays projects. The wreath is so cute and I loved the List layout. this collection is so fun. Pinned them all, awesome projects especially the wreath! What a super cute wreath! I shared on FB. Shared on FB! Thanks for the chance! Love the fun kit! I shared on FB!! I love this Christmas set to cute!!!! Ooh! So many cute examples! I've loved everything doodlebug produces, but I'm really loving this year's return to classic holiday colors. What cute products... love the wreath and the layout is adorable with all the sweet papers and embellishments. I tweeted about this post =) Thanks for a chance to win this fun prize! 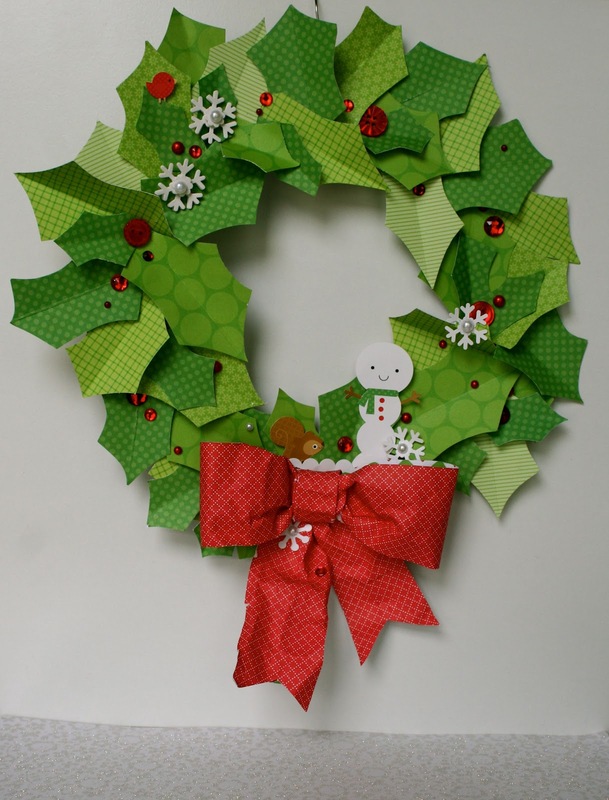 I pinned the wreath... love the paper and other stuff in the essentials pack.... so hope to win this! Thanks for the opportunity! I pinned and posted to facebook the "List" layout. Always love Doodlebug, this collection is really neat! !Thanks for the chance to win it! Pinned it! :) The wreath is the coolest! Thank you for sharing this adorable wreath and giving us the chance to win some great kit goodies to make our own version! I pinned that awesome wreath! Pinned the list layout--love the use of patterned paper. Super cute. I tweeted about the whole post. I'm @ReaCuster on Twitter. The LO is wonderful, too!!! TFS! The colors of this collection are SO bright and cheerful and your projects are simply delightful!! I pinned this ultra cute collection on Pinterest. I love everything you guys do - even your packaging brings a huge smile to my face!! The jewels set is so cutely presented. You guys are so awesome!! On my facebook post I commented on the extreme cuteness and cleverness of this holiday project using a fun bright holiday essentials kit. I love paper crafting with dooddlebug stuff - Thanks for a way cool idea to make! I pinned this! You guys have such cute paper kits! I shared this page with my Facebook friends! I absolutely LOVE this project, super cute and adorable collection! I pinned the project on Pinterest! pinned on Pinterest. Love this cute collection. Cute, cute project! Pinned it! I NEED this collection!! It's adorable!!! Just pinned a project - http://pinterest.com/pin/196680708697951208/ Thank you for the chance! I pinned and shared on Facebook! Shared on Facebook and pinned! :) Thanks for the giveaway! Love this collection! The reindeer is adorable and I love the mini pops!! Thanks for the chance!! Oh, I also shared on facebook! I don't pin, too addicting! LOL!! And I emailed my scrapping BFF!! I pinned the wreath, way cute. Tweeted about the fun! https://twitter.com/Elliesworld/status/250069030176690177 Thanks for the chance. This is absolutely one of the cutest Christmas lines I have ever seen...so much fun!